Mikael Godée, soprano saxophonist and composer living in Gothenburg. He studied at the Academy of Music and Drama at Gothenburg University and has been touring with his music all over the world, from Russia, Hungary and Israel to South Africa, Brazil and the United States. He is also the winner of a "Grammis" and "Jazz i Sverige". "Mikael Godée is one of the main ingredients of what we call the Swedish jazz. His involvement in groups Corpo and Änglaspel, where his lyrical and warm soprano saxophone creates a unique musical atmosphere, has been hugely important in today's jazz scene "
MalvaKvartetten is a string quartet driven by great creativity and are not afraid to stand out. They like to push the limits when it comes to choosing repertoire, experimenting with sounds and communicating with the audience. They put value in presenting music by young composers, music from different parts of the world and cultural spheres that do not usually get the focus of art music. MalvaKvartetten was formed in 2008 at the Academy of Music and Drama at Gothenburg University where they studied chamber music at bachelor and master level. They have also conducted sharing studies String Quartet at the Hochschule für Musik "Hanns Eisler" Berlin. 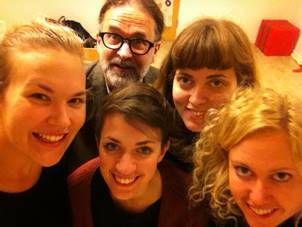 Today the quartet playing is their main occupation, based in Gothenburg and Stockholm. "After many years together on the Swedish scenes but also inspired by the continent today MalvaKvartetten is a true unity that brings out many sides of the music and extracts a variety of qualities." THE COLLABORATION between Mikael Godée and MalvaKvartetten started in 2015. Mikael has nurtured a dream for a long time to write music for soprano saxophone and string quartet, and MalvaKvartetten saw the potential of a creative exchange. The five musicians are experimenting with the sounds of string instruments and soprano saxophone, which can merge into a unique timbre as well as providing a musical challenge. The space for improvisation is also an important key of this musical collaboration. The music is close to chamber/ classical music. Malva's responsive interaction and Godée's lyrical melodies makes a tremendous opportunity for a lasting musical collaboration that will make an impression. We are proud to present a concert with new music that can capture a wide audience. Please find the link below the info text.